The Conditioned Air team of Naples, Fla., joined Rheem® in celebration at the company’s Top Pro Partner™ awards dinner and reception in Washington, D.C. on April 24, 2018. The event recognized and rewarded an elite group of HVAC businesses that demonstrated excellence in Rheem sales, customer support, and overall service during 2017. 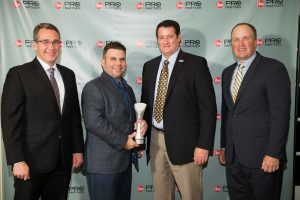 Pictured from left to right are Randy Roberts, vice president, sales, Rheem Air Division; Timothy DuPre, Conditioned Air; Jeff Zanella, Conditioned Air; Mike Branson, executive vice president and general manager, Rheem Air Division.